Do you like to make up new, redonkulous words and invent new meanings for them? Redonkulary® is the hilarious nonsense word game where creativity and persuasion win! This portable game includes 60 spiral-bound word-part cards with over 200,000 possible combinations. Score sheets included. Laughter guaranteed! Ages: 9-99. Number of Players: 3-8. Play time: 10-45 minutes. Redonkulary® is an original game bound to become a classic! Redonkulary® is Easy to Play! One player goes first as the “Donkster” (judge) and invents a word by combining one word part from each of the three randomly chosen cards. The other players then create “definitions” for the made-up word and try to convince the Donkster to pick theirs. The player who persuades the Donkster to choose their definition earns a point. The player with the most points after everyone has had a turn as the Donkster wins! There is no “right” or “wrong” answer—just fun! Redonkulary® is an Absolute Blast! Adults love Redonkulary®, too! This is one of the best card games for family game night and parties with friends. It is a great ice-breaker because it is interactive and ridiculously funny! Redonkulary® will have you laughing until your faces hurt and then turning your favorite nonsense words into hashtags to keep you laughing for weeks! 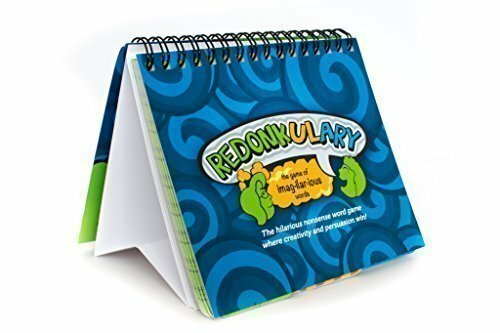 Redonkulary® is perfect for kids, tweens, teens and adults! It is uniquely suited for multi-generational play because it one of the few games that players with different ability levels can play together and enjoy equally. Redonkulary® provides a fun, connected experience for family and friends to share! Redonkulary® promotes critical thinking, creativity, persuasion, listening, memory, communication, reading, and emotional intelligence. It stimulates the brain and keeps players thinking on their feet! Best of all, it's fun! Players write their names across the top and their made-up words down the front of the score sheet. Persuade the Donkster to pick your definition and earn a point! The player with the most points after everyone has had a turn as the Donkster wins! Write your favorite definitions on the back to keep laughing about how crazy you can get! “Are we there yet?” What parent hasn’t heard this age-old refrain more times than he or she cares to remember? Keeping children entertained on long trips can be challenging, even for the most patient, prepared, and creative parents. On one particularly long trip, I began making up silly words and even sillier definitions with the kids. Before we knew it, the whole family was laughing, interacting, and having fun together! And voila: Redonkulary® was born! Redonkulary® quickly became our family’s go-to game to combat boredom not only on road trips, but also in waiting rooms, long lines, and even at the dinner table. Soon, instead of asking, “Are we there yet?” or getting absorbed into an electronic device or TV screen for hours, the kids asked to play Redonkulary®. Luckily, Redonkulary® is just as fun for parents as it is for kids, so we readily agreed to play. We felt good about turning what could have been wasted time into constructive, quality time with the kids. Redonkulary’s® popularity among our family soon spread to other families and friends of all ages- from stoic grandparents to the "cool" teenagers down the block. Because there are no "right" or "wrong" answers, Redonkulary® appeals to everyone! Use the hyphen and skip the middle card to create a shorter word. Lobby the Donkster to pick your definition by giving an example and telling a story about your definition. The funnier the better! Appeal to the Donkster's interests (such as favorite team, food, or hobby) in your definition. Look at the card numbers if you want to keep track of the cards you have used. Create your own house rules! Redonkulary® encourages creativity! Win-win! Select additional winners for most hilarious, ridiculous (Redonkulous! ), or realistic definition. Get out the vote! Instead of allowing the Donkster to be the sole judge of who wins each round, allow players to vote on the winner. The player with the most votes at the end of each turn wins that round. Short on time? Limit each turn to one minute or set a timer to end the game. Inexperienced Players? Make teams by matching players with different ability levels. Make it a dice game! Roll three 20-sized dice and choose word parts that correspond to the numbers on the dice. This short YouTube video demonstrates how to play Redonkulary®!